Morgan James Publishing, 9781683503811, 130pp. Achieve anything you want while living with chronic illness. Are you frustrated by being constantly sidelined by your health? Do you feel like every time you dig into a project your chronic disease gets in the way? Do you worry that living with a chronic illness means you will never feel well enough to reach your goals? 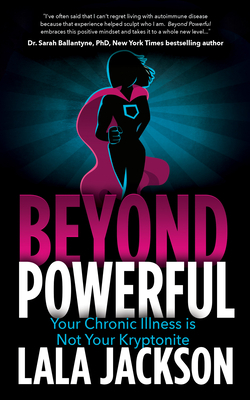 In Beyond Powerful: Your Chronic Illness Is Not Your Kryptonite by Lala Jackson weaves personal anecdotes of being an overachiever living with autoimmune disease with inspiring and entertaining stories of go-getters who use the super powers gained by life with chronic illness to reach massive goals. If you are someone who lives with chronic health issues and are searching for a way to keep running toward exactly what you want to bring to the world then Beyond Powerful has the answers you need. Lala Jackson has been navigating the world of being an over-achieving go-getter who lives with chronic disease since she was 10 years old and diagnosed with autoimmune type 1 diabetes. She uses two machines - an insulin pump and a continuous glucose monitor, both of which are attached to her body 24/7 - to keep herself alive. However, chronic disease doesn't run her life. She loves adventures, always has more than a few projects in the works, and doesn't know how to do much of anything halfway. When not speaking or writing, Lala lives in Brooklyn, does work for a non-profit with a mission to cure type 1 diabetes, and loves traveling to literally anywhere with a swimmable beach, whipping up a paleo concoction, attempting to not fall over in yoga, throwing paint on a canvas, or flat out sleeping. Because knowing when to rest is everything. She grew up between Hawaii and Washington State, graduated from the University of Miami in Florida with a communications degree, has a heart for all things multicultural, and is obsessed with recognizing all of us who are beyond powerful - because chasing dreams while living with chronic disease is no small task. She's also a Gryffindor. For more information, visit lalajackson.com. For speaking and writing inquiries, or for any other questions, email at lala@lalajackson.com.